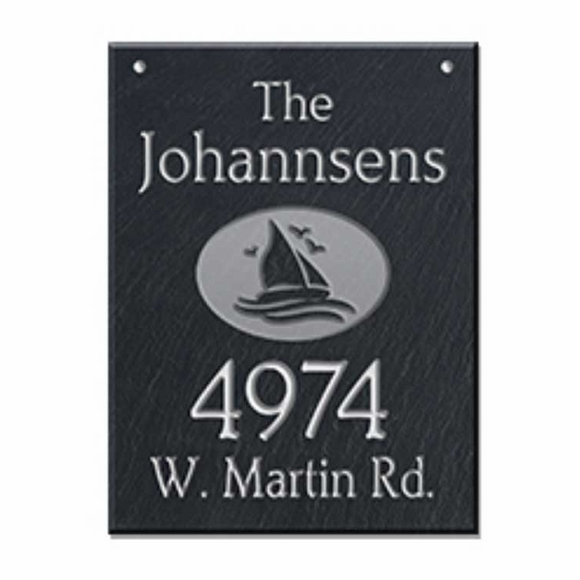 Hanging Address Sign with Sailboat - - personalized 12" x 16" natural slate address plaque. Custom made for you. On the two sided version, sailboat logo, color, and personalization text are the same on both sides. The one-sided sign has the name & address you supply and the saliboat on the front only. Comfort House also sells other design themes: cats, dogs, ducks, palm trees, bunch of grapes large animals (horse, deer, bear, moose), nature (leaves, shamrocks, trees), and beach (dolphins, seashell). See Comfort House item #66615F). Line 1 (family name holds up to fifteen 1.5" characters. Line 3 (street name) holds up t0 fifteen 1.25" characters. You can also buy this sailboat theme hanging slate address sign in a horizontal orientation.